In 2018, one year after the Gold Krugerrand celebrated its 50th anniversary, demand was still incredibly high for all things Krugerrand, including these Quarter-Ounce Gold Krugerrand Proofs. These coins were available only in set configurations, making single pieces like this so scarce that only a fortunate few collectors are ever able to add one of these popular and coveted coins to their collections. 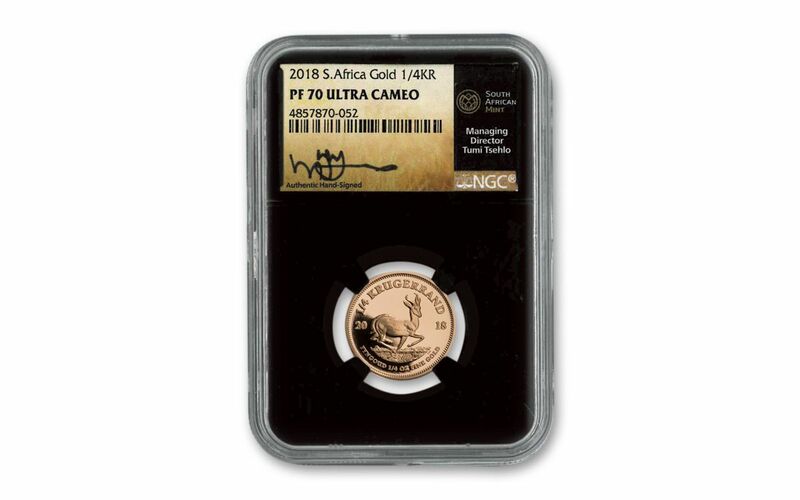 In addition, NGC has certified this Quarter-Ounce Gold Krugerrand Proof will come sonically sealed in an acrylic holder with a black display core. 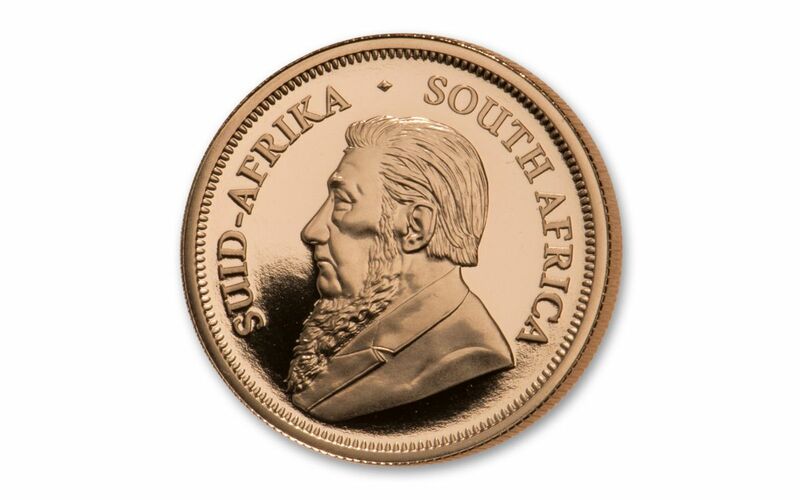 STRUCK IN FINE GOLD – These 22 mm Krugerrands are struck in a Quarter ounce of 91.7% gold. GRADED IN PERFECT PROOF CONDITION – Your 2018 South Africa Quarter-Ounce Gold Krugerrand has been graded by the Numismatic Guaranty Corporation (NGC) to be in flawless Proof-70 Ultra Cameo (PF70UC) condition. INCLUDES KEY MINT OFFICIAL’S SIGNATURE – Your 2018 South Africa Quarter-Ounce Gold Krugerrand comes sonically sealed in a protective display holder with a label personally signed by Tumi Tsehlo, Managing Director of the South African Mint. 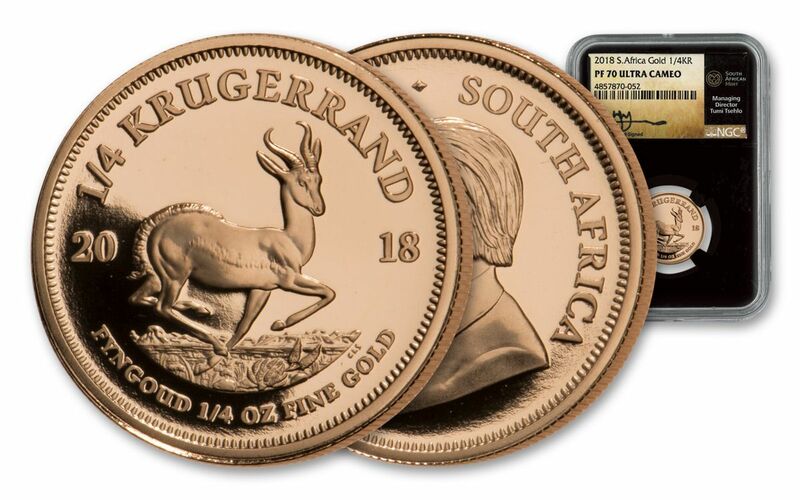 LOW LIMITED EDITION – The South African Mint struck just 2,000 Quarter-Ounce Gold Krugerrands Proofs in 2018 – and they were available only in set configurations from the Mint. Don't wait to claim this global phenomenon for your collection. 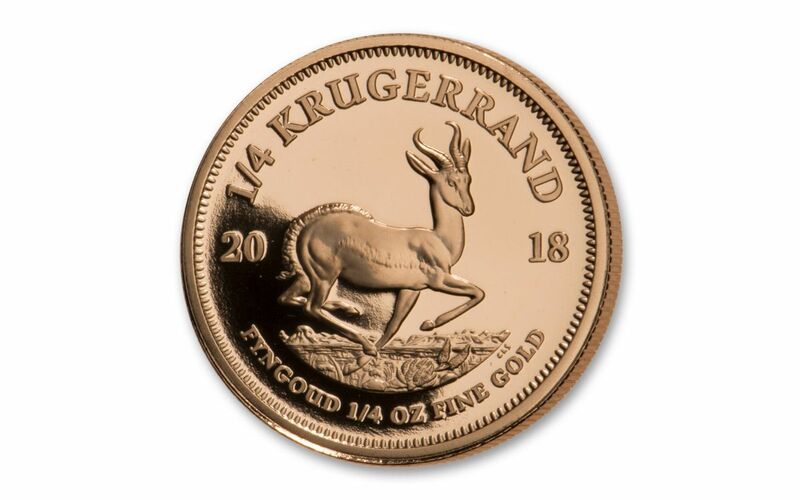 Bring the 2018 South Africa Quarter-Ounce Gold Krugerrand home to your collection now!